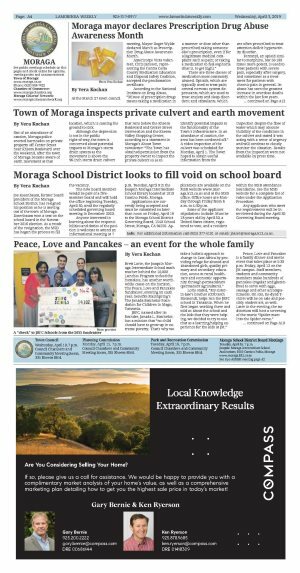 Joe Rosenbaum, former board president of the Moraga School District, has resigned his position as he is moving out of the town of Moraga. Rosenbaum won a seat on the school board in the November 2016 election. As a result of the resignation, the MSD has begun the process to fill the vacancy. The new board member would be part of a five-member board and will hold the office beginning Tuesday, April 30, until the regularly scheduled governing board meeting in December 2020. Anyone interested in learning about the responsibilities and duties of the position is welcome to attend an informational meeting at 7 p.m. Tuesday, April 9 in the Joaquin Moraga Intermediate School library located at 1010 Camino Pablo, Moraga. Applications are currently being accepted and must be submitted no later than noon on Friday, April 19 to the Moraga School District Governing Board, 1540 School Street, Moraga, CA 94556. Applications are available on the MSD website www.moraga.k12.ca.us and at the MSD office. Office hours are Monday through Friday from 8 a.m. to 4:30 p.m. Some of the applicant stipulations include: Must be 18 years old by April 30, a United States citizen, registered to vote, and a resident within the MSD attendance boundaries. See the MSD website for a complete list of rules under the Application Procedure. Any applicants who meet the requirements will be interviewed during the April 30 Governing Board meeting. Info: For additional information call (925) 377-4101 or email: jbaier@moraga.k12.ca.us.